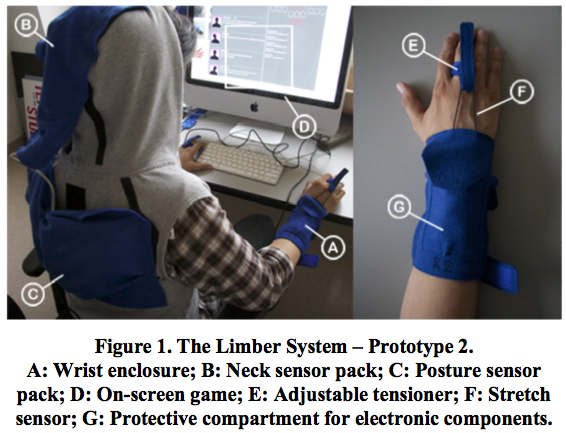 Limber refers to an interconnected system of wearable, sensor-enabled components and game-like desktop software, designed to reduce repetitive stress injury among knowledge workers. Regular bodily movement/exercise and maintenance of good posture is rewarded with within a game experience during the course of a workday. Presented here are two design and evaluation iterations that illustrate the utility of the system and identify key design challenges. Repetitive stress injuries (RSIs) are a host of debilitating conditions affecting the musculoskeletal and nervous systems, caused largely by repetitive tasks or maintaining awkward body positions for extended periods. Knowledge workers are prone to such injuries due to prolonged sitting and the physical nature of their work tasks (e.g. repetitive typing). However, RSI can be prevented through strengthening exercises and good posture . The main goals of the Limber project are to produce wearable, sensor-enabled enclosures that monitor body parts susceptible to RSI in knowledge workers, and feed this data into a game-like experience residing on work computers, to incentivize regular bodily activity and proper posture. An emphasis was also placed on the DIY nature of the design, employing simple construction with off-the-shelf materials and components together with open-source code, so that the system could be reproduced and tailored by an individual, thereby ‘helping themselves’. After a brief consideration of related work, this paper discusses two prototypes exploring these possibilities, targeting improved physical activity and posture in the wrist, back, and neck. The development process involved material and form explorations, electronics development, software programming, and user evaluations. Previous examples of wearable devices that encourage therapeutic activity through pleasurable feedback include rehabilitation gloves enabling stroke patients to control virtual reality experiences , and sensor-driven physiotherapy games for individuals with motor disabilities. Such research tends to focus on acute conditions with significant impairments, while Limber explores the “casual” use of wearable devices for prevention of common office RSIs and postural issues. Our first prototype consisted of two wearable components: a pair of arm-mounted enclosures that monitored the amount of wrist flexion, and a torso-mounted enclosure which gathered postural data from the neck and back, both sending sensor data wirelessly to the user’s work computer. Sewing patterns for these enclosures were established early in our design process to ensure ease of reproducibility. The arm enclosures were created from a single piece of elastic fabric, enabling them to be slipped onto a variety of arm diameters. 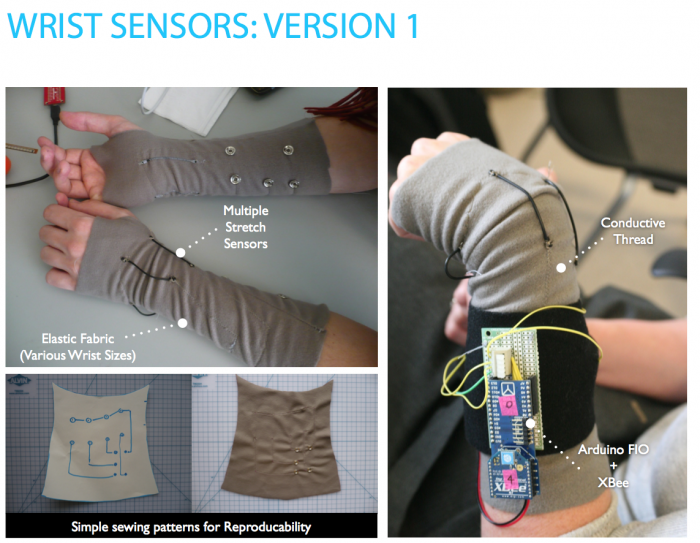 Four commercial stretch sensors, sewn into the fabric directly over the wrist, were used to measure the range and directionality of wrist movement, while an Arduino microprocessor  (connected to the sensors via channels of conductive thread) relayed this data to the base station via an XBee radio . 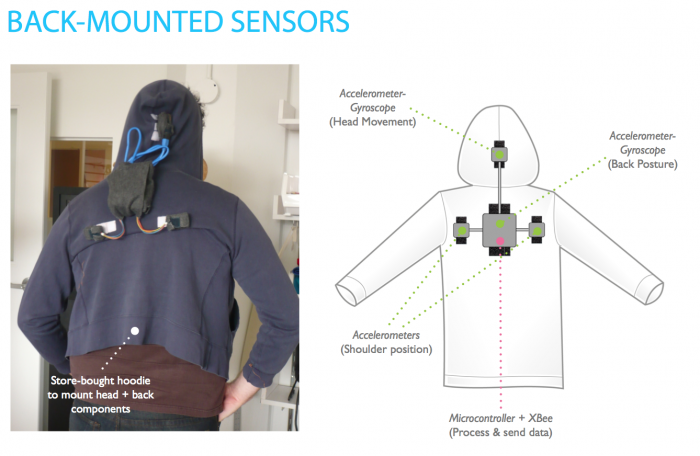 The torso enclosure was fashioned from a store-bought “hoodie”, with accelerometers attached to the shoulder blades and accelerometer-gyroscopes positioned over the spine and the neck. Data from the sensors was processed by an onboard Arduino, and transferred to the user’s computer via USB, where simple calculations were applied to detect postural and mobility issues. We prototyped a variety of interactive experiences on the user’s desktop that responded to the sensor data, exploring both positive and negative reinforcements as incentives -- for example, playing increasingly faster drumbeats the longer the user’s wrists remained inactive (negative); transforming the user’s wrist movements into sine-wave music (positive); displaying encouraging and humorous messages on-screen to reward good posture and regular neck movement (positive). During a design evaluation of the prototype (a 4-hour testing session with seven researchers from our team as participants), the main concerns expressed were the fragility of wearable enclosures, insufficient responsiveness of the wrist-based stretch sensors, difficulty in mapping movements to variations in sound, and the intrusive nature of the drumbeat feedback. The majority of the testers also felt that an experience involving positive reinforcement, with game-like mechanics and rewards, would provide the most effective incentives. For our second prototype, we focused on developing a game-like interactive experience built on an enhanced Limber wearable assembly. The “game” was integrated into the user’s desktop environment and ran in the background while they worked, providing encouraging messages as popups (accompanied by alert sounds) to reward wrist/ neck movements and proper posture, and reminder messages when inactivity or bad posture was sensed. The software also featured a scoring system to reward good behavior (Limber points), and gently punish bad behavior (Unlimber points). An interface displayed the user’s ongoing score, as well as a log of their bodily activity for tracking progress. The wrist enclosures were redesigned to increase durability while maintaining adjustability, employing a thick felt fabric with velcro-laden straps and loop tensioners to fasten them around arms of various sizes. To improve the responsiveness of the sensor component, we decided to use a single stretch sensor, the end of which was attached to the user’s middle finger via an adjustable tensioner -- the increased tension yielded more accurate readings. We performed our design evaluation for the second prototype with a group of 4 <blinded>university employees with computer-based occupations. We briefed each tester on use of the system, installed the software on their work computers, then allowed them to interact with the prototype at their desks for 30 minutes, ending each session with a structured interview to ascertain their experiences. A researcher on our team also performed testing over 5 days. All of the testers reported that the Limber system improved their awareness of bad bodily posture and habits (slouching, sustained inactivity) while engaged in work tasks. However, many of the testers also mentioned some discomfort while wearing the enclosures during the session -- the hoodie became too warm , and the tensioner attached to the middle finger became sweaty or abrasive. Some aspects of the system also became distracting to users during work tasks -- the alert sounds accompanying the popup dialogs were sometimes obtrusive, and most users did not habituate easily to the sensation of the arm enclosures. There was also concern that the aesthetic design of the enclosures might place them at odds with the formal dress code of some office settings. Users generally found the scoring system to be an effective incentive for increased movement and better posture, and were excited at the prospect of a more social experience where individuals or even entire office departments could compete with each other for Limber Points. Key areas for future development include further material and form explorations to improve comfort; more modular design of the wearable components to facilitate integration by users into their own office attire; connectivity between Limber systems to enable social play and competition; a game experience less disruptive to users’ daily flow of work; sensor-enabled enclosures for other body parts that play a role in office-related injury. We have presented the preliminary design and evaluation of a sensor-enabled wearable system for knowledge workers, using body data to drive a game experience that rewards mobility and good posture. 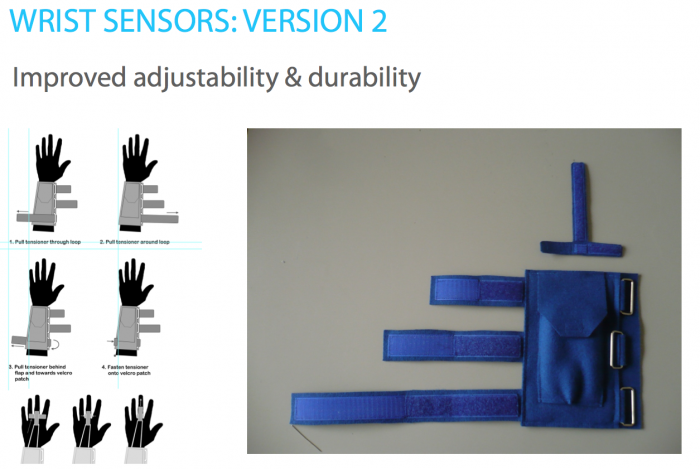 Our experiences so far suggest that simple wearable DIY sensor assemblies can be integrated into office work environments to promote injury prevention in an unobtrusive manner, but that comfort, fashion and work protocol remain critical design concerns. VEGA EDGE - SIMPLE. ELEGANT. WEARABLE LIGHT. The Vega Edge is easy to use and versatile. 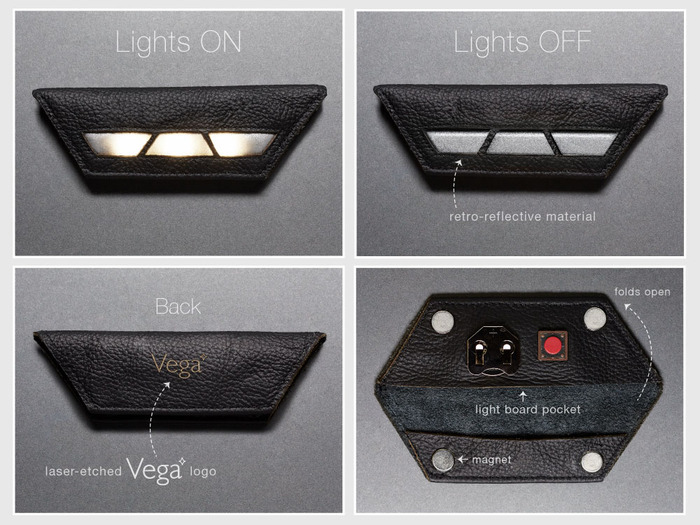 Made with laser-cut leather, it snaps securely to your clothes using four strong magnets. It has a thin strip of retro-reflective fabric integrated into the design for added visibility. You can wear it discreetly by day or brightly at night on your coat, cardigan, hood, scarf, handbag, collar, pocket, belt, or wherever you’d like a touch of light. Find us on Kickstarter at edge.vegalite.com. Read more about VEGA EDGE - SIMPLE. ELEGANT. WEARABLE LIGHT. SoMo is a discreet wearable device that generates real-time sound through body movement. Wearing SoMo is a playful, interactive experience that inspires creative movement. It’s easy to wear, simple to use and can be applied within the fields of education, physical therapy and the performing arts. We worked closely with dancers and choreographers from Ballet Jorgen and The Studio for Movement to develop the device with the goal of making SoMo easy to wear and the software interface simple to use. 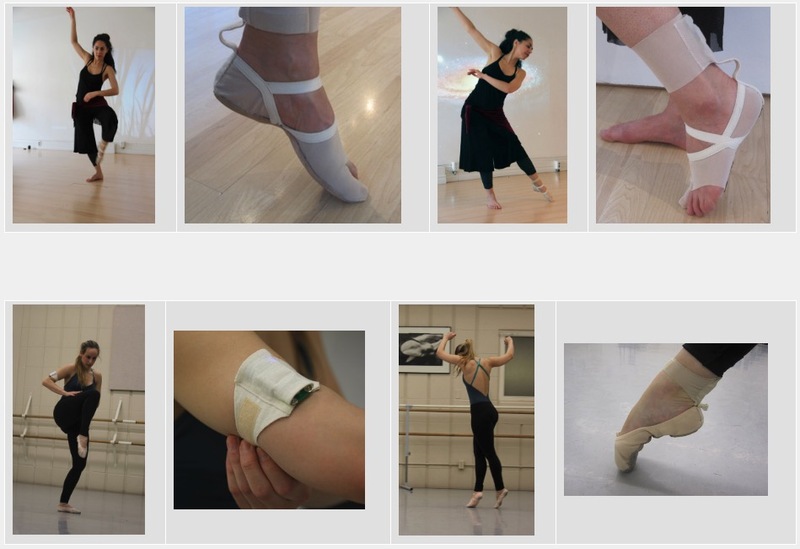 Our research included experiments with accelerometers and pressure sensors embedded in the dancers’ footwear. Please view Ballet Jorgen's most recent performance using SoMo and featuring the artwork of Daniel Wurtzel. The soundscape for this piece is being generated within a chosen musical key and mode. ​​​​​​​Ballet Jorgen & SoMo performance at GBC from Loretta Faveri on Vimeo. Tweetris -- pairs compete in front of a large display to make random Tetris blocks (Tetrominos). A picture is taken of the winner of each round as they make the shape, and this is tweeted to TweetrisTO. Anyone can play a game of Tetris using these Tetromino images in real time on their smartphone or web browser. This was a curated exhibit in Scotia Bank Nuit Blanche on October 1, 2011, and has since been demoed at the Digifest 2011 conference, Dalhousie University Open House, and will be submitted as an art exhibit to TEI 2012. Research is currently underway to examine factors impacting gameplay (setting, audience participation, observation of prior players) over the course of Nuit Blanche. This SSHRC Partnership Development Grant examines novel forms of cross-disciplinary and cross-sector partnerships necessary for creating world class academic research on digital media. It also intends to provide novel insight for private industry and for commercialization, as well as new venues for the innovative work of artistic and cultural organizations. This research partnership develops a digital economy trading zone that connects the diverse interests, knowledge and values from a diverse set of partners. Its focus is on a developing aspect of digital media, namely, the increasing materialization of digital media and the related interweaving of physical and virtual modes of engagement. The project therefore brings together working groups in order to develop concrete projects that provide value to each of these groups. The three groups include members from academic institutions, cultural organizations, and private SMEs, and are organized around the following inter-related themes; Space, Play, and the Self. The grant includes as co-applicants, Professor Sara Grimes from the Faculty of Information, Professor Megan Boler from OISE, and Professor Mary-Lou Lobsinger from the Faculty of Architecture, Landscape, and Design at the University of Toronto, as well as Professors Kate Hartmanand Professor Emma Westecott from OCAD University, and Professor Jason Nolan from Ryerson University. The project runs for three years and primarily provides salaries and stipends for masters and PhD students. In this working group, we will explore how digital games and other play technologies enable multi- modal practices that traverse and integrate the virtual and the material in a variety of ways. Examples of this include the production of tangible “ludic artifacts” (Tolino, 2009), the interplay of situated and digital practices within mobile gaming, the phenomenon of alternate reality games (ARG), and the incorporation of physical motion within kinetic game systems (such as Wii Sports). With the rise and spread of pervasive gaming and portable devices, digital play becomes resituated as a transitory, in- between and oftentimes liminal activity, as play is reintroduced into a broader range of the spaces and activities of everyday life. Our academic team includes Sara Grimes, an Assistant Professor in the Faculty of Information who has published extensively on the political economy of games and game play, Associate Professor Jason Nolan who runs the EDGE gaming lab at Ryerson University, and collaborator Emma Westcott, an assistant professor at OCAD. Game developers Play Dynamics Inc. and HugeMonster are our private partners.